Intel’s roadmap for low-power server chips, presented Julu 22. 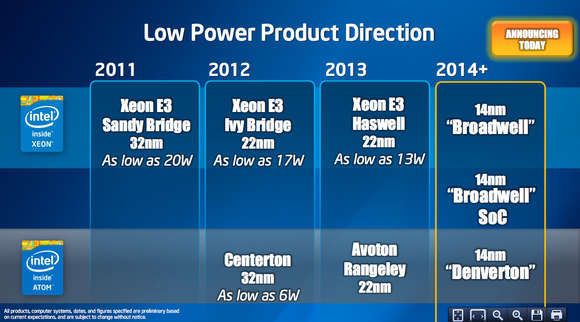 It shows the upcoming Broadwell SOC straddling the Xeon and Atom families. “Also with Avoton, we’re adding ethernet functions and accelerators for various workloads,” she said. Avoton will be manufactured using a 22-nanometer process. It will be followed next year by Denverton, a similar chip but manufactured on a 14-nanometer process. The numbers refer to the dimensions of circuits printed on the chips, and smaller numbers generally mean faster, lower-power transistors.